Illustration courtesy of Elder Hosiery Mills, Inc. These Elder Thermal socks are knitted in Burlington, North Carolina, U.S.A. The Elder Company was founded in 1919 by the Elder family, and is still owned and operated by the same family today. Elder has developed the capacity and reputation as a manufacturer of heavyweight thermal socks, and they have been instrumental in developing several thermal styles in conjunction with the Army Research Department for military use. Those thermal socks passed the ARD's rigorous tests. Elder's background and experience with woolen yarns and man made fibers is extensive. In addition, much of the knowledge gained as a result of research completed for the military is incorporated into Elder socks for the serious hunter and outdoorsman. These socks use the best fibers and technology available to insure cold weather comfort. The examples that I have been wearing for my winter hunting this year are Style T 864, an over the calf thermal sock in gray marl with a blaze orange top and blaze orange accents at toe and heel. I guess if I pull off my boots and roll-up my pants to run around in my socks, at least I won't get shot by a careless hunter. The fact is that these socks have been keeping my feet comfortable, warm, and dry inside of my Browning Featherlight leather hunting boots. Elder advertises "Wicking Action" for these socks. This is accomplished by use of moisture repelling yard and moisture wicking yarn in the construction of the sock. The interior is made of terry loops of high loft acrylic for wicking action and the toe is seamless for increased comfort. These are definitely good features. 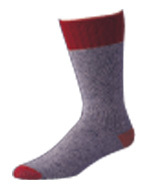 The sock is made from 65% high bulk acrylic, 18% wool, and 17% stretch Nylon. Elder pronounces these socks, "Unconditionally Guaranteed," but against what is not spelled out. Maybe against anything? I have several pairs of these socks, and I'm glad that I do. Comfortable socks are one of those things that it is easy to overlook until it's too late. Then you'll wish you'd worn some. I bought my most recent pair on sale in the Sporting Goods Department of the Bi-Mart discount department store in Cottage Grove, Oregon. The sale price was only $5.99, and these socks are easily worth twice that amount. Try 'em and I bet you'll agree.